Valley teachers standing together with their Harvard math professor after graduation, from left to right, are Crystal Chagoya, La Joya ISD, Jose Constantino, Mercedes ISD, Jose Villagomez, Weslaco ISD, Queen Martin, La Joya ISD, Homer Colunga, Weslaco ISD, Diana Gill, South Texas ISD, Andy Engleward, Harvard Graduate Extension School mathematics director, and Rey Jope, McAllen ISD. MERCEDES — Donned in her cap and gown, Queen Martin led her fellow classmates through Harvard’s gates to receive their master’s degrees. It was cold and rain drizzled when they walked into Harvard Yard to listen to their guest of honor, Mark Zuckerberg, the founder of Facebook, at the school’s 366th graduation ceremony. Martin, a La Joya ISD high school math teacher, was selected class marshal. 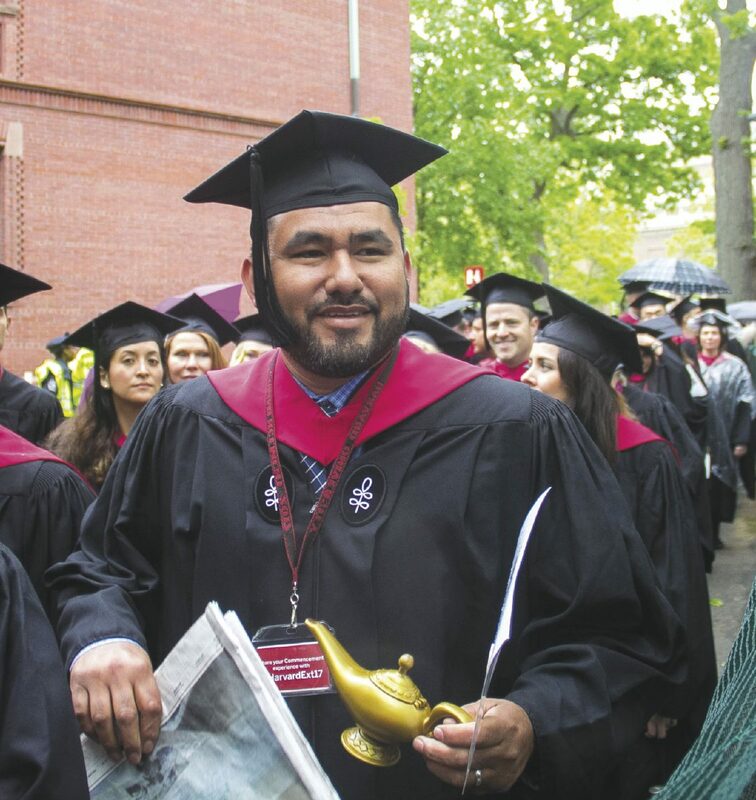 Mercedes High School math teacher Jose Constantino walking through Harvard Yard at the start of the university’s graduation ceremony. 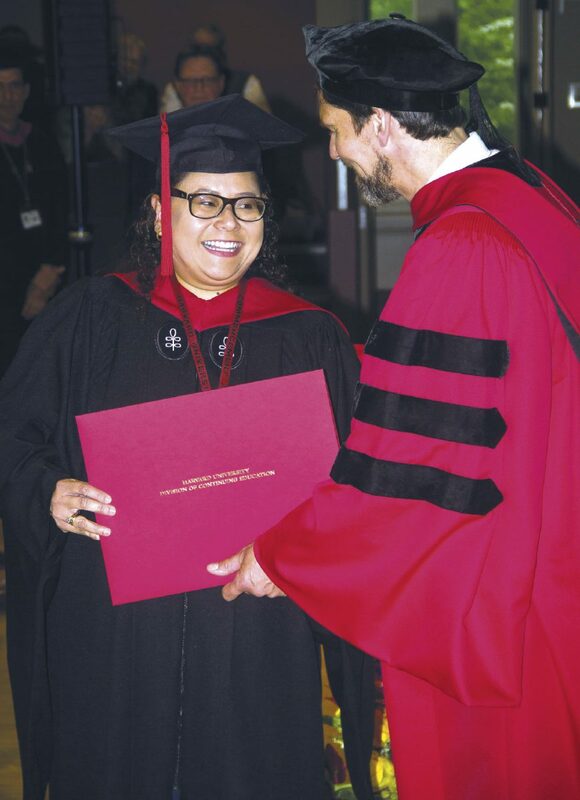 La Joya math teacher Queen Martin receiving her master’s degree from Andy Engleward Harvard Graduate Extension School director of mathematics for teaching graduate program. 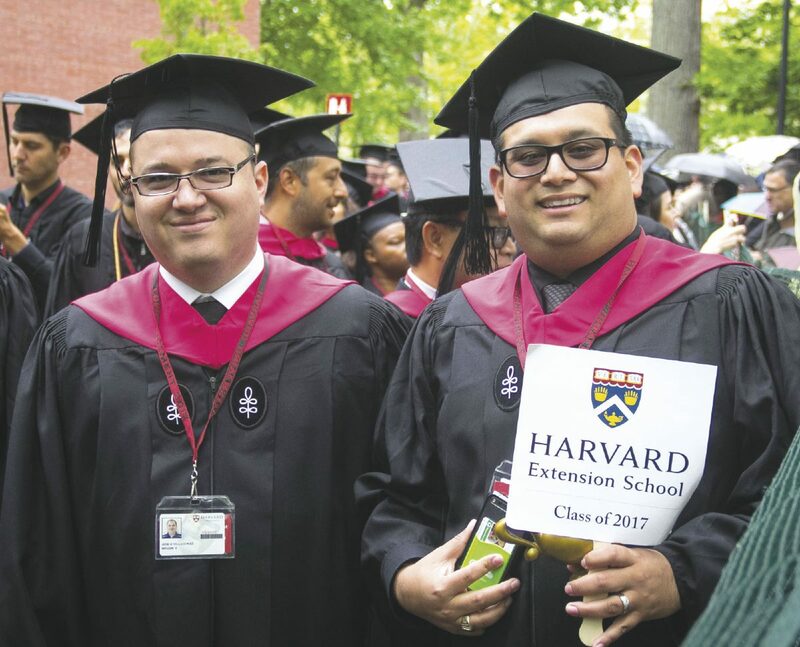 Weslaco Independent School District math teachers, left to right, Jose Villagomez and Homer Colunga completed the Math for Teachers master’s degree program through the Harvard University Graduate Extension School. Martin and a group of Valley math teachers are the second Texas Graduate Center cohort to earn a master’s degree in Mathematics for Teaching through the Harvard University Graduate Extension School. The Texas Graduate Center is a component of the Texas Valley Communities Foundation, a nonprofit based in Mercedes dedicated to the betterment of public school education in the Valley by providing graduate programs to teachers and opportunities to high school students to visit Ivy League colleges. They were among the 7,066 students to receive their degrees at the country’s oldest university last month. 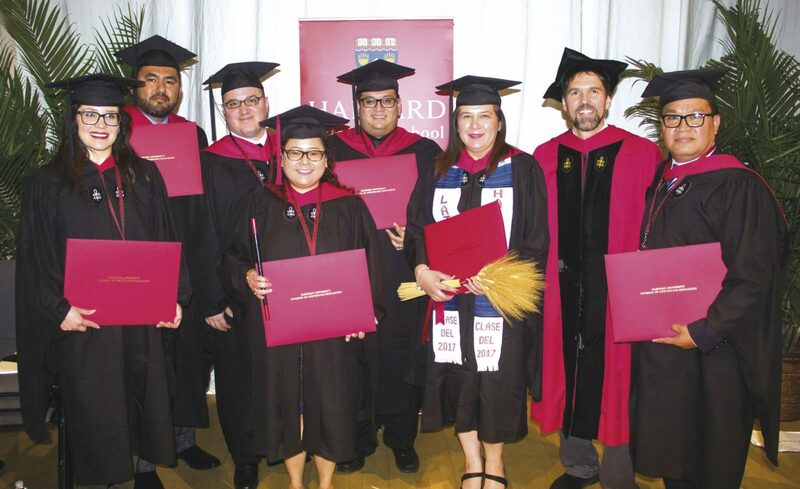 Nine teachers from six Valley school districts graduated and are the Texas Graduate Center’s second cohort to complete the Harvard program. Constantino said when he started his teaching profession, he was not content with just teaching math to students for the sake of passing a state assessment. Constantino said this year, all of his Algebra One students passed the Texas State assessment. He said the Texas Graduate Center and Harvard provided plenty of tools and resources to assure the success of the teachers in the program. According to the Texas Graduate Center the 38 teachers in the Harvard program instruct 100 to 120 students each year. So over a 10 year teaching span more than 30,000 students will be taught by Harvard teachers. The teachers involved in the Math for Teachers master’s program follow a three-year graduation plan. Most have made great sacrifices because Harvard requires they attend classes on the Harvard campus during the summer for seven weeks. “Students have been the greatest beneficiaries of this program. Now I’m able to keep them engaged and intrigued in mathematics learning,” Constantino said.